Yesterday, as I'm sure you all know was Valentines day. 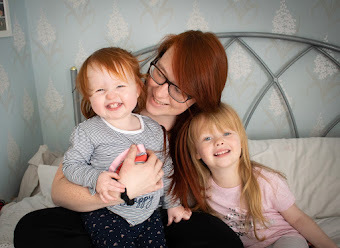 While we are not big fans of Valentines day, and usually just give each other a card, this year I thought I would take the opportunity to do lots of Valentines themed activities with Emily, as I'm sure you have seen we made Valentine Krispie Hears, Vanilla cupcakes, and we did Ice Sensory play. I thought why not do some painting, colouring, sticking or whatever Emily wanted to do. 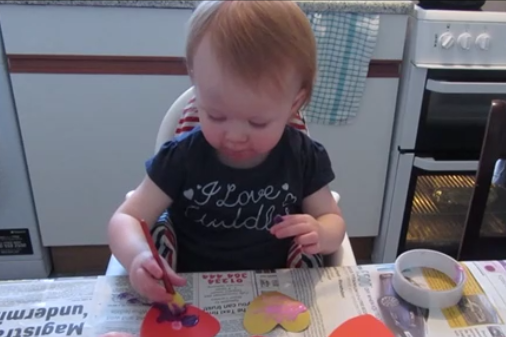 We started with colouring, I let Emily have the heart shapes, and she was able to pick whatever colour she liked. Emily is really confident with holding her pencil, and enjoys colouring so I knew she would like this. 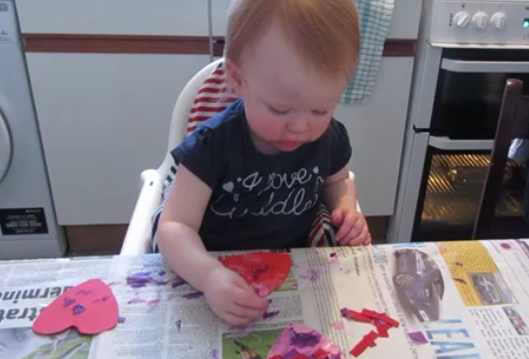 She coloured two hearts before she spotted the paint. It has been about a month since I did painting last with Emily, and I have to say she is a lot more confident now, than she was last time. 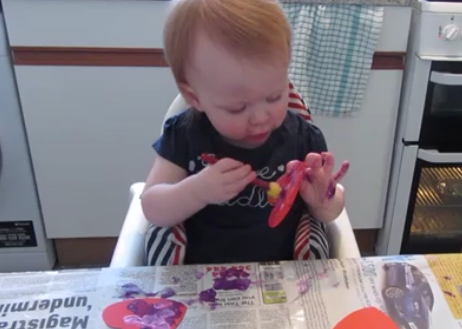 She really enjoyed using the paintbrush to create marks, and then I have her a circle sponge. She loved pushing it down on the heart and would say 'blob, blob, blob' everytime she made a mark. Emily then tried sticking for the first time, I cut up some tissue paper, and gave her some PVA glue. Once she figured out the paper stuck to the hearts she was really happy and eager to do it again. I think her favourite part of the whole activity was the sticking. Once we had finished, I then popped the 6 hearts (2 coloured, 2 painted, 2 glued) into a frame. In our house we have lots of mis matched frames all over the wall, for a while I have been keeping Emily's pictures, paintings and colouring pictures to add to the wall. This picture is going to look perfect on the wall. I'm so impressed with how it turned out and will definitely be making more in the future. What a lovely activity for the pair of you to do and so nice to have a lasting keepsake from it. Awww that's looks fab, such a great idea. Looks like you both had lots of fun creating your masterpiece. The hearts look really cute framed. Well done on keeping it so tidy too! The last time we tried painting at home we were all pretty much covered with it! 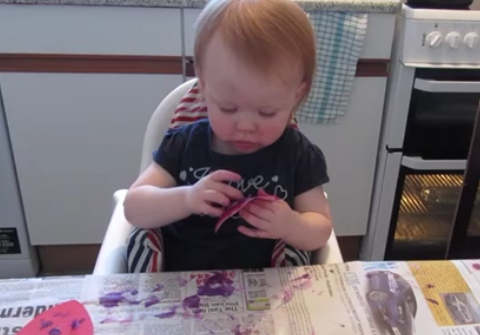 What a lovely activity and she looks like she is doing a fab job. An artist in the making I am telling you lol! They look so gorgeous in a frame- a lovely memory made. Such a clever little girl :) That is a lovely activity and so nice that you have framed it. Aw that is such a lovely idea. oh bless her, she really got stuck in with it didn't she. What a great activity! It turned out really well too. I need to do more crafty activities with my toddler but I'm still reeling from the great PVA incident of '14. Let's just say the cat wasn't happy. Oh no, don't let it hold you back! Children will be children and they are only young once! Thank you, don't be fooled she does make mess too! Thank you, It looks beautiful on my wall with all of our family pictures.